EP-34 Tape Echo plug-in for the UAD-2, Software Delay/Echo from Universal Audio in the UAD Plug-In series. loudfunk's review"The king of all delays..."
Download the UAD software authorization and you're good to go. 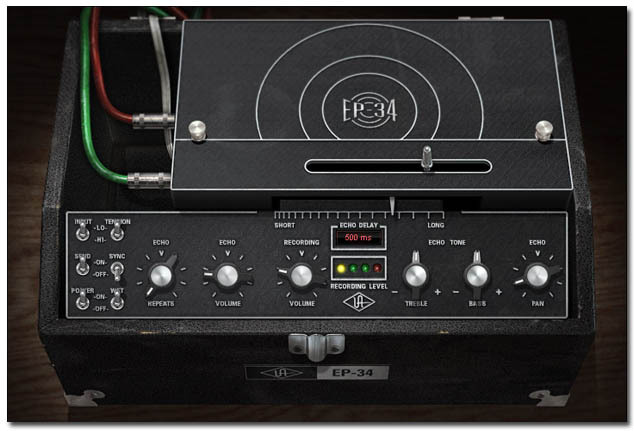 The EP-34 combines EP-3 and EP-4 sonics and features to achieve the best of the later solid-state Echoplex* designs. The Echoplex uses an infinite tape loop combined with a sliding record head that allows the user to achieve the desired delay length. 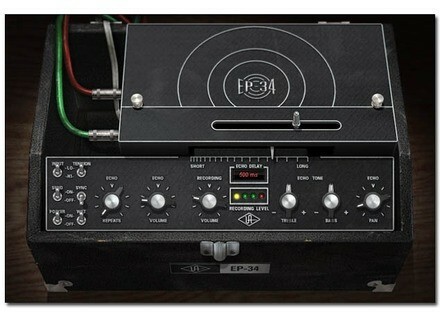 EP-34 emulates the great idiosyncrasies of these tape-based echo units such as the unique Echo Delay record head slider that can be moved in real-time while used in conjunction with the Echoplex’s Echo Repeats control to create echo and pitch chaos. The distinct and musical input clipping is captured in the units’ Record Volume control making the EP-34 a tone box for distortion. Echo Volume allows the blending of the original and effected signal, however even the dry signal is affected by the unit. The Echoplex self-oscillation capabilities are captured as well, including the “squelch” effect (an interruption in self-oscillation) achieved at extreme set- tings when processing low-frequency material like drum loops with heavy kick drum. All this makes the EP-34 more than just a delay, but an instrument that can be played by manipulating the controls while in chaotic oscillation. Just like the hardware, faster-than-tape-path speeds can also be achieved, leading to ‘sonic-boom/tape squeal’ effects again adding to chaotic but musical at- tributes of the original hardware. The EP-34 also has other warts-and-all arti- facts of tape such as self-chorusing due to speed variations caused by random friction in the tape path plus pinch roller wow and flutter. The EP-34 includes the metering and unusual but uniquely musical tone controls found on the EP-4, but removes its undesirable in-line noise reduction circuit that users often electronically disabled (Maestro removed this circuit soon after the product’s release). “Extras” not found on the original hardware include Tempo Sync, Input Select (allows for a cleaner sound [LO] or a dirtier sound [HI]), Tension (the Echoplex has an adjustable tension nut underneath the delay time slider for a snappy or sludgy response time), Echo Send (identical in function to RE-201 “dub switch”), Wet Solo, Pan (wet signal only), and Power (plug-in bypass).